With tourist arrivals at 23.6 million last year – an increase of 18 million since 1998 – Malaysia has swiftly risen to become one of the Top 10 international tourist destinations in 2009, according to a United Nations World Tourism Organisation report. Such an increase has resulted in the local multi-billion ringgit tourism industry’s need for additional skilled manpower to serve in hotels, resorts and other facilities that cater to tourists and holiday-makers. For students seeking a course that offers a global study perspective and hands-on training opportunities under the guidance of leading experts in hospitality, INTI‘s Diploma in Hotel Management (DHM) would be the ideal choice. The programme is affiliated with Blue Mountains International Hotel Management School, one of Australia’s top providers of hotel and resort management education. DHM incorporates international best practices through its adoption and refinement of the Swiss Hospitality Education Model, which balances and integrates theoretical knowledge with practical training; giving students the opportunity to practice what they have learned. Moreover, students undergo industry placements resulting in experience in real-life work environments. INTI‘s Diploma in Hotel Management programme balances and integrates theoretical knowledge with practical training. Our hospitality programme ensures that our students are prepared for the workplace by acquiring a broad range of skills encompassing the culinary arts, languages, management and more. They will graduate with the relevant knowledge and skills to help fulfill the country’s need for hospitality professionals,” said Mrs Joyce Yuen, President of INTI International College Subang (IICS), where the programme is offered. “We are also very realistic in our approach and want our students to be aware of expectations in the workplace. We have invited representatives of the hospitality industry to talk to students. Our latest guest speakers were Renaissance Hotel’s Director of Food & Beverage, Mr. Christian Heidenreich, and Restaurant / Lounge Manager, Mr. Derek Charles Gomez, who shared their experiences and expectations with the students,” she added. Students of DHM will receive a dual award upon graduation: the Diploma in Hotel Management awarded by INTI and an International Diploma in Hotel Management awarded by Blue Mountains International Hotel Management School, Australia. Graduates of the two-and-a-half-year course conducted at IICS’s School of Hospitality also have the opportunity to pursue degree studies at Blue Mountains, Australia. Students may enroll for an accelerated 15-month international hotel and resort management program which includes internship in Australia or other countries. Students of INTI benefit not only from the years of experience and strong track-record that INTI offers, but also gain from the global synergy and resources that Laureate International Universities provides. INTI is part of Laureate, the world’s largest private education network with a presence in 24 countries, with more than 50 accredited campus-based and online universities and 130 campuses, serving 600,000 students globally. Since becoming part of the Laureate network – the world’s largest and fastest growing private education group, INTI has introduced a number of firsts in Malaysia including the Semester Abroad Programme (SAP) which allows INTI students to study for a full semester at a Laureate institution of their choice while paying local fees. 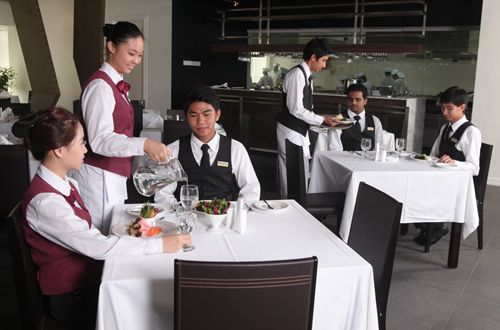 INTI‘s Diploma in Hotel Management programme is available in January, March, May and April each year. For more information on this and other courses at INTI, call 1300-88-4684 or visit www.newinti.edu.my.